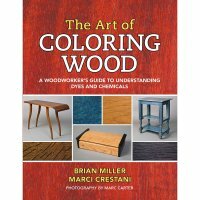 Under the expert guidance of Brian Miller, professor of wood technology, The Art of Coloring Wood eliminates any fear of handling paints and lacquers. Thus, this book is the perfect introductory literature for anyone who wants to learn more about this kind of surface treatment. Miller focuses on the six most popular wood species used by woodworkers - maple, white oak, mahogany, walnut, cherry and alder - and goes into the specific properties in terms of colouring. Each chapter offers recipes, insights and many eye-openers that make getting to know paints and varnishes fascinating.